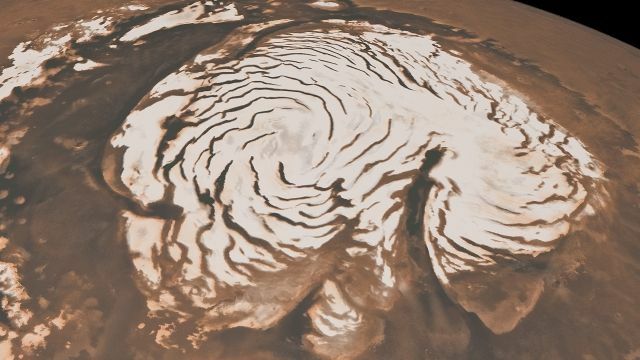 An image from the Mars Reconnaissance Orbiter (MRO) shows abundant dry ice deposits. Could this be the new rocket fuel? According to gizmag.com, Northumbria and Edinburgh universities have been developing a carbon dioxide-based engine to fuel a mission to Mars. Using the physics of the Leidenfrost effect, the abundant dry ice deposits on Mars could be used to propel a spaceship, without the crew needing to haul along extra fuel for the trip home. Lots of dry ice (a.k.a. possible fuel), just chilling on Mars. The Leidenfrost effect involves bringing a liquid into contact with a surface significantly hotter than its own boiling point. A small portion of the liquid vaporizes, creating an insulating layer of steam that levitates the liquid while protecting it from some of the heat. An everyday example of this would be watching a droplet of water skitter across a hot frying pan. The phenomenon is exacerbated when the surface is ridged, effectively propelling the water over the tops of the surface. A droplet dances over a ridged surface. Scientists floated a block of dry ice over a surface with circular ridges, which created a turbine effect causing the block of ice to consistently rotate. Attaching magnets and copper coils to the dry ice created an electric motor that generated alternating current as it spun. This breakthrough is considered to be the first time that the Leidenfrost effect has been used for propulsion or to create energy. A small-scale example of the Leidenfrost effect. Not your usual power source! Dr. Rodrigo Ledesma-Aguilar, a co-author of the Northumbria research, explained, "Carbon dioxide plays a similar role on Mars as water does on Earth...It is a widely available resource which undergoes cyclic phase changes under the natural Martian temperature variations. Perhaps future power stations on Mars will exploit such a resource to harvest energy as dry-ice blocks evaporate, or to channel the chemical energy extracted from other carbon-based sources, such as methane gas." Early American pioneers had steamboats and steam engine trains; early Martian pioneers might have this! For humanity's future to transcend our earthly bonds, we'll need to continue thinking like this - not just outside the box, but outside the conventional uses of physics of our home planet. Sustainable clean energy is just as important when building a new world on Mars as it is in saving our world here on Earth. Now, the possibilities for pioneering mean re-exploring our known scientific universe as well as our unknown prospective challenges further out in the galaxy. The Leidenfrost engine, keeping it cool.